An exemplary selection of mature grain and malt casks from North British, Strathclyde, Cameronbridge, Glenfarclas, Ben Nevis, Balvenie, Kininvie, Glenfiddich, Alt-a'Bhainne, Auchroisk, Glenallachie, Westport, Speyside and (of course) Macallan distilleries, blended and married in first-fill Oloroso sherry butts. While others blend to produce year-in, year-out consistency, each edition of THE EXCEPTIONAL BLEND will offer a whisky that is authentically individual, possessed of its own qualitative and stylistic distinction. Blended Malt Scotch Whisky (previously known as Vatted Malt or Pure Malt) is a blend of different single malt whiskies from several distilleries. The malts would have been skilfully selected to create an whisky of unique and idiosyncratic character. The vatting process (re-casking into a single container) allows the flavours of the individual malts to integrate (to "marry" together). 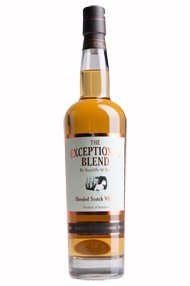 However, unlike the whiskies simply labelled as "Blends/Blended", vatted malts do not contain any grain whisky. One of the most renowned ambassadors of the vatted malts category has been Johnnie Walker Green Label. Other examples include Poit Dhubh, Eleuthera by Compass Box (vatted from Caol Ila and Clynelish), Macphails and Berry Bros. & Rudd's pride, Blue Hanger. Find out about other whisky styles in the dedicated pages for Single Malt Scotch Whisky (Lowlands, Highlands, Speyside, Islay, Campbeltown, Orkney, Skye, Mull, Jura, Arran ) Grain Whisky , Blended Whisky , Vatted Malt Whisky (aka Blended Malt).